G Scale Strasburg Railroad #90 takes on plowing duties! This is a really entertaining clip by this backyard rail enthusiast that will have you grinning ear to ear! 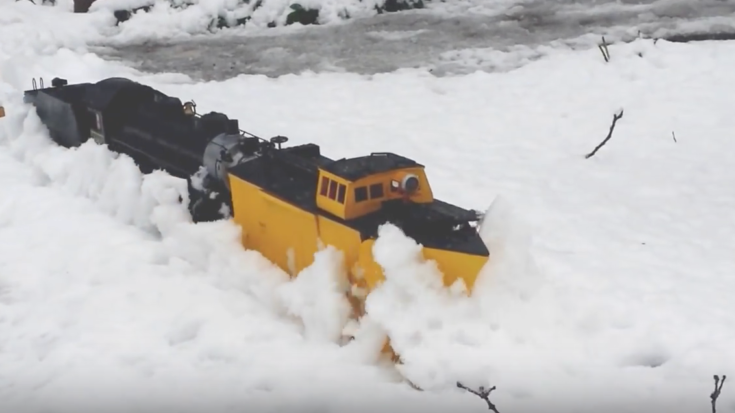 “G” scale trains are approximately 1/2 inch to the foot or 1:22.5 inches, or about twice the size of Lionel trains.The snow in this video is just right for this engine and plow to break it apart. Outdoor railroads are referred to as “Big Trains” or “G” scale (Garden Railroad) and have been long established in Europe, particularly Germany and Great Britain. H Scale at 1:24 used to model narrow gauge railroads at 3 ft 6 inches. If you have or are a backyard rail enthusiast, please let us know your comments!